After Apollo’s visit to Olympus, where he was greatly admired for his beauty, the god of music travelled the Earth searching for a suitable home. His journey comes to an end at the port of Delphi, where he proclaims that he will build a temple that will serve as an oracle for men and a proxy for his revelations to them (Middleton, 285). Or, if you were to ask ancient historian Diodorus of Sicily, a goat shepherd happened upon a chasm while herding his goats and leaned his head over the divide whereupon he breathed in the vapors and went into a euphoric state and began predicting the future. Word spread amongst Delphi and soon the entire town was at the chasm predicting futures. Until citizens started falling in, that is. The danger of the abyss led the people to the genius idea of appointing a woman to the task of receiving visions from the vapor. She was sat upon a tripod over the chasm to protect her from falling in (Oppé, 218-219). Regardless of her true origins, divine or otherwise, the result of the chasm was the same: on the seventh of every month, countless people gathered to have their fortunes divined by the Oracle of Delphi from 1400B.C. – 381 A.D. (Roach). From dusk ‘til dawn, the people of Greece waited in line for the chance to hear their future. The first in line were the people of Delphi; second preference was given to a city chosen by Delphi; and the rest drew the remaining lots. Those who did not make it into the adytum that day had to come back next month and try their luck again (Parke). While there are a number of plausible reconstructions of the Temple of Apollo, there are few, if any, of the adytum specifically. This is the area where the priestess would preform her ritual and receive her visions from Apollo over the vaporous chasm. I was inspired by the Oracle of Delphi and fascinated with the abyss that brought her divinations. My inspiration is what drew me to attempt a reconstruction of the Oracle Chambers in the Temple of Apollo. My chosen method of reconstruction is a blueprint drawing based on historical accounts and research of the temple. As an artist channeling my inner architect, I am interested in creating a historically accurate setting of the Oracle receiving revelations from Apollo. I hope to provide a context of the Oracle that helps art historians envision life in the temple during the Oracle’s golden age. Luckily, geologists John Hale and Jelle Z. De Boer give an amazing description of the entire Temple of Apollo in their article from the 2002 November/December edition of Archeology Odyssey, “The Oracle of Delphi – Was She Really Stoned?” They describe the Sacred Way into the temple where fortune-seekers would wait all day to get into the lower chamber. If they finally made it downstairs, visitors were faced with great, golden statue of Apollo and the omphalos – or “navel” – stone. Connected to this chamber was the adytum (Greek for “not to be entered”). The adytum contained the priestess on her tripod above the fissure. Visitors would wait in the chamber outside the adytum and ask their question to a priest. The priest would relay the question to the Oracle and translate her answer back to the visitor. Together, De Boer and Hale formed a team including chemist Jeff Chanton and toxicologist Henry Spiller to investigate Delphi. What they discovered overturned the generally accepted belief that the ancient Greeks had simply misconstrued the facts and mistaken the chasm for a nearby gorge and that the vapor emission were a myth. A.P. Oppé proposed this idea after his trip to the 1927 French excavation site of Delphi, where they found no evidence of a chasm. Amandry of the École Française d’Athènes reinforced Oppé’s belief in a 1950 publication. Amandry stated that hallucinogenic gasses could never have been emitted at Delphi because only volcanic activity could produce such fumes. What Amandry did not realize was that Delphi was actually a hot spot for tectonic activity, as Hale and De Boer’s team discovered on their expedition. In 1996, De Boer and Hale’s team began surveying the area of the temple and discovered two intersecting faults. The first, which they named the Delphi Fault, runs east to west. The second intersecting fault, named the Kerna Fault, runs southeast to northwest. The Kerna Fault runs along the natural springs in the temple complex, the largest being the Kerna Spring for which the fault was named. De Boer conducted a study of the remaining active springs near Delphi and discovered evidence of ethylene gasses, known for causing disembodied euphoria. According to De Boer, the Delphi and Kerna faults meet underneath the Temple of Apollo. The vaporous fissure was likely caused by the crossing of these faults and has since been destroyed by the inevitable tectonic activity. In any case, their research is vital to any discussion of the Oracle of Delphi. They set out to prove the scholarly community wrong with modern science and made amazing discoveries that prove the chasm at Delphi existed and emitted ethylene gasses. Their investigation and detailed research was essential to putting the pieces together to form my reconstruction of the Oracle’s chambers. De Boer, Jelle, and John Hale. “The Oracle of Delphi—Was She Really Stoned?” Archaeology Odyssey, 2002. Middleton, J. Henry. “The Temple of Apollo at Delphi.” The Journal of Hellenic Studies 9 (1888): 282-322. Oppé, A.P. “The Chasm at Delphi.” The Journal of Hellenic Studies 24 (1904): 214-40. Parke, H.W. “The Days for Consulting the Delphic Oracle.” The Classical Quarterly 37, no. 1/2 (1943): 19-22. Roach, John. “Delphic Oracle’s Lips May Have Been Loosened by Gas Vapors.” National Geographic News, 2001. Accessed April 19, 2015. http://news.nationalgeographic.com/news/2001/08/0814_delphioracle.html. In 1801, Thomas Bruce, the 7th Earl of Elgin, began his controversial removal of half the sculptures in the Parthenon. Greece at this time was occupied by the Ottoman Empire. In 1811, the Earl received a permit from the Ottoman sultan giving him permission to take the marble pieces. However, when the Earl was asked to present his permit, he had lost the original permit and only had an Italian copy. Following his excavation, the Earl fell on hard times. He lost half of his nose to an infection, his wife left him for his best friend, and he was forced to sell his collection of marbles to the British government for £35,000 to cover his divorce. The British claim they have the right to keep the marbles. They believe they purchased the pieces legally, if the Earl’s permit was legitimate. The Earl was given permission by Greece’s occupied government at the time. The British argue that the marbles are safer in Britain, anyways. Greece is an unstable country and had nowhere safe to store the marbles for a long time. In addition, any court ruling stating that the marbles should be returned to Greece could affect the ownership cases for so many other artworks in museums with questionable ownership. Greece responded by building the New Acropolis museum to properly house their ancient artifacts. These marbles are a part of Greek history and culture and the legality of their removal from the Parthenon is uncertain. It has not been proven that the Earl’s permit was even legitimate. Greece believes they would not be setting up any detrimental precedents because they are only asking for the marbles from the Parthenon and certain other precedents have already been set where stolen pieces were returned to their rightful owners. If the Parthenon marbles were reunited in Greece, they could be set up in a situation that more closely resembles their original context. The British Museum has not shown the same level of care for the marbles that Greece will. Greece has set up the New Acropolis with state-of-the-art technology to care for the marbles where the British have damaged them in cleaning sessions and endangered them in transportation. The British public even believes Greece has the right to their marbles, according to opinion polls. Greece’s argument is just too strong to deny. Especially when these marbles were most likely illegally obtained to begin with. If, however, the Ottoman sultan’s permit is legitimate, the Ottoman Empire no longer exists and Greece is independent. Any past agreements made by the Ottomans are not relevant today. The British refusing to return the marbles is stubborn. They hold far more value to Greece than Britain. Also, it would be far more convenient for professionals studying Ancient Greek art for the pieces to be easily accessible in one country. Being able to see them in their original context holds more value than keeping them in Britain where they are less important. Kimmelman, Michael. “Elgin Marble Argument in a New Light.” The New York Times, June 2009. McGuigan, Cathleen. “Romancing the Stones.” Newsweek, June 2009. Ares, son of Zeus and Hera, is god of warfare. In the Roman pantheon, he is known as Mars. He personifies the brutal, animalistic violence of war. Ares was not a very well liked or widely worshipped god, unlike his Roman counter-part, who was only slightly more liked. He is often portrayed with Fear, Terror, and Discord, represented by his sons, Phobos and Deimos, and his sister, Enyo, respectively. Ares often makes rash and intuitive decisions that often lead him to defeat and humiliation. Unlike Athena, the goddess of strategic warfare, Ares is known for not thinking things through and rushing into battle head-on. He is mostly depicted bearded, young, and dressed for battle. His lack of distinctive features can make him difficult to identify. Ares has many great adventures in Greek mythology. Some – most notably the Trojan War – end in failure and humiliation, as depicted in Homer’s Iliad. Initially siding his mother and sister, Hera and Athena, to fight with the Greeks, Ares was convinced by his lover, Aphrodite, to back the Trojans instead. This, of course, incurred the fury of Athena and Hera. During the battle, Ares lost his son, Askalaphos, to Deiphobos of Troy. Once Zeus allows the gods to join the battle on whichever side they pleased, Ares finally enters the battlefield and is joined by his Amazon daughter, Penthesileia. However, she is quickly slain by Achilles. When Ares and Athena finally met on the field, Ares is defeated and led away by Aphrodite. For all his rash violence, nobody can question Ares’ love for his children and his demand for justice. When Poseidon’s son, Halirrhothius, raped Ares’ daughter, Aclippe, Ares sought revenge and killed Halirrhothius. Ares was taken to trial held on the hill Acropolis in Athens. In the end, Ares was acquitted. 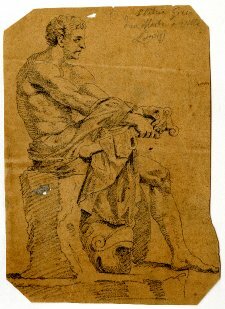 Paolo Alessandro Maffei’s drawing of the Ludovisi Ares sculpture shows a seated Ares holding his sword and resting his foot on his helmet. In the original sculpture, it is the figure of Cupid at Ares’ feet, not his helmet. Cupid’s presence indicates that the sculpture could be a romantic gift or some symbolism of softness contrasted with Ares’ harshness. The replacement of Cupid with a helmet completely eradicates the idea of any romance and instead places Ares in his natural combative habitat. Perhaps this is the moment before or after battle, where Ares sits in contemplation. Encyclopedia Brittanica. “Ares.” August 6, 2013. Accessed March 11, 2015. “Collection Object Details.” British Museum. Accessed March 12, 2015.